Each week, the National Book Critics Circle will post a list of five books a critic believes reviewers should have in their libraries. We recently heard from Ina Hartwig of Frankfurter Rundschau. Here is what she pointed out as worth keeping in your library. Written in Turkish exile by the grand German Jewish Romanist, away from his personal library, these essays on the “performed reality in the occidental literature” (“dargestellte Wirklichkeit in der abendländischen Literatur”) are so smart and inspiring and in a lovely way not pretentious and old fashioned – an incredible testimony of human memory. Heinrich Heine: Die romantische Schule – The Romantic School (1835). Literary history as critique: An example of how one can be cruel and lovely at the same time, polemical and bitter, and never indifferent. Reading Heines “Romantic School” you feel that every sentence comes from the bottom of a great hysterical intelligence. Roland Barthes: Sade Fourier Loyola (1971). Marcel Proust: Contre Sainte-Beuve (1908/09). Stunning that “A la recherche du temps perdu” is the result of Prousts intellectual and poetic battle against the influential french critic Sainte-Beuve. Writing “contre” Sainte-Beuve, Proust developped one of the most important novels of the 20th century. “Contre Sainte-Beuve” is a plaidoyer against the prison of the biography, for the freedom and beauty of unconscious subjectivity. Susan Sontag: Under the Sign of Saturn (1980). The art of the portrait. I admire the elegance and stylistic freedom of these biographical and analytical essays. Conventional writing, eccentric thinking. Ideal. 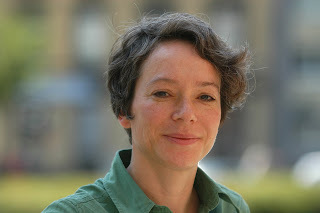 Ina Hartwig, born in 1963 in Hamburg, is a literary critic and editor at Frankfurter Rundschau. She published a book “Sexuelle Poetik” on Proust, Musil, Genet and Jelinek in 1998 at S. Fischer Verlag. 2002-2005 co-editor of the Magazine “Kursbuch”. Max Kade-Visiting Professor at Wahington University in St. Louis, USA (2002), visiting professor at the University of Göttingen (2007/08). "The Critical Library: Ina Hartwig" was posted February 28, 2008.